March 19, 2013 By Tina M 22 Comments This post may contain affiliate links. Read my disclosure policy here. Make Something Monday: This can be anything along the lines of a craft, smoothie, art project with the toddler, or if we’re feeling really adventurous maybe an epic music video 🙂 Okay, probably not on that last one…..I do however plan on making up a whole bunch of games and activities involving my toddler and water. I Love the water, and she seems to have adopted, or inherited, (or whatever) that same love! We will be getting wet this summer. Often. 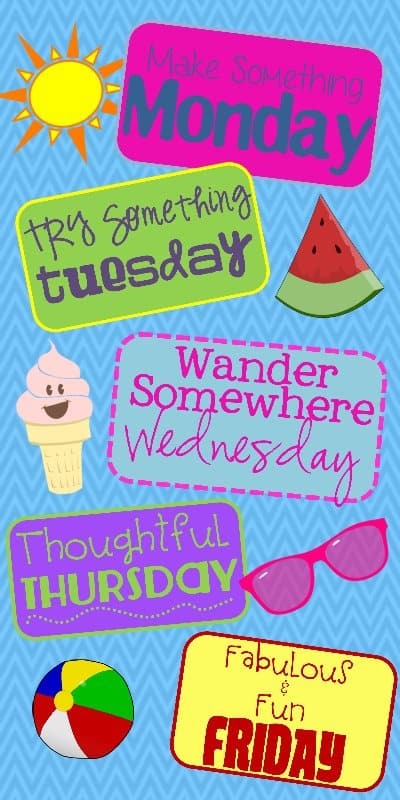 Try Something Tuesday: This involves trying something new. New recipe, new outfit, new song, new storybook, whatever me and the little one feel up to that particular day. Wander Somewhere Wednesday: This is our day to make extra focus on going somewhere. Maybe it’s an outing to the pool or library, or maybe it’s just a walk in the stroller, but it’s somewhere. Thoughtful Thursday: This is our day to think of others (not only today, just extra focus on Thursdays)! There seems to always be someone who I need to thank for something…this is the day to actually make the card, or send the note, or bake the cookies. I truly believe that gratitude is an important part of happiness in this life, and I want to make it a focused part of each week. Fun Friday: This day has absolutely no format or guidelines other than having fun. Whatever we do on this day, we will have fun. Fridays should be easy. 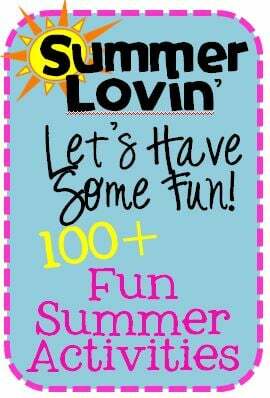 What things do you especially like to do the make your summer fun? Make and freeze my own homemade popsicles made with fruit juice. Here’s a brilliant idea for keeping the sticky off little fingers! I saw this idea on Pinterest to make a tin foil river in the back yard, Cheap, fun and easy! Watch Tangle and set off chinese lanterns (unless they are illegal in your state). Feed the ducks (I don’t currently know where any are around here, but I will find some)! Make a water blob: ultimate summer fun in my opinion! 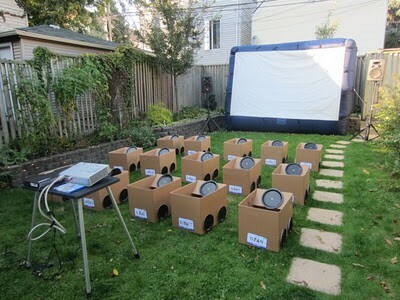 Outdoor Movie (laptop? Or maybe will borrow the projector from my husband’s work 🙂 Here’s a fun idea to make cars for the kids out of cardboard. Parade! Parade! Parade! We will attend a parade this summer, as always. I love me some parades. Parades especially make my summer fun, I don’t really know why. I plan to do an open water swim in the lake this summer with my husband. I love swimming! Wash the family car together: turn summer chore into family summer fun! Have a water Pinata party! Lemonade stand or bake sale (Okay, my daughter is too young for this, but maybe I’ll do it with my nieces and nephews. This was one of my favorite things to do as a kid! Take a scenic drive with the windows down (Here we like to drive up the canyon or through the Alpine loop). Night Games! What’s summer fun without kick the can or Ghost in the graveyard? Yard Sale! Get the kids involved and let them have fun with it. Some of my favorite yard sales to go to are ones where the kids are selling some of their own toys to earn money, or ones where kids have made their own crafts or goodies to sell. If you have a trampoline, put a sprinkler underneath and throw a few balls into the fun. One of my favorite things as a kid. I’m going to make a homemade (and cheap) “splash pad” for my toddler this summer. Not completely sure how I’m going to do it, but when I am I will let you know! Freeze some treasures in a block of ice, give your kids some tools (safe ones), and let them have at it! Buy something from the ice cream truck (gotta do this once a summer). Play some red rover with the kids (or partner tag if that sounds too aggressive). PUDDLE JUMPING! Another one of my favorite activities as a kid. Summer is the only time the rain isn’t too cold to jump around in, take advantage of that and put on some old clothes and Splash Splash splash! the kids will love it! Heck, I was still doing this in college. So fun. Attend a baseball or soccer game! I’m not a super huge fan of either of those sports, but it’s fun to attend at least one because it’s just fun! Marshmallow wars! Make your own marshmallow guns with pvc pipe (or make one with plastic cups) and let the kids go wild! Paper airplanes. Fly them from the deck, the top of a hill, or from the upstairs window. On a rainy day, cozy up on a bean bag or pillow and have a read-a-thon. Don’t forget treats! Plant a garden. Let the kids help. Create a WIPEOUT obsticale course! On the of the funnest ideas I’ve seen on Pinterest lately! What activities are you most excited for this summer? What do your kids especially enjoy for summer fun? This is a great post! I love having a list like this all in one place. Thanks! You’re very welcome Samantha, thanks for stopping by! Wake up, eat breakfast, get dressed, go outside. Stay outside. Grow some food outside. Eat said food outside. Come in and nap. Go back outside. Stay outside. I literally cannot soak up enough sun! Really hate the blahs of January and February, so I’m with you on letting the fun come early this year! p.s. do you know if it’s a boy or girl?? Haha Beth, I guess I could have just summed up my post with those words! Yes, it is another girl! Hi there! I have ventured over from Linkin’ with the Ladies hop. I’m enjoying this little peek into your world! Just lovely! I’m hosting a super duper group giveaway, on my blog. Don’t miss out! And if you’d like to be a co-host on my next giveaway, I would be honored! Thanks!! I am going to pin this for this summer! Thanks for sharing this on Domestic Superhero’s link party this week! Thanks for the pin Arzea! It sounds like you have a lot of really fun things planned!! So nice to see that have that thinking of others day included in there as well. We all need to do small things to help each other. Such great ideas for the summer ahead! And congratulations on the little one due in June! Great ideas, love all your categories! Wishing you a happy summer with your new little bundle of joy! What an awesome list! Pinned and am featuring you! Thanks for linking up at Family Fun Friday. This is such a cute idea! And can I say how much I love this blog? It is so creative. I will definitely be stopping by here more. Thanks for some awesome info, I can tell you have spent a lot of time researching and getting the best stuff out there. Alexis, you are so welcome! I too wish there weren’t as many regulations! I was once an elementary education major, but learning about all the regulations and all the ways the government tells you what you can and can’t do kind of took the fun out of teaching for me. Good luck with your summer, I hope it’s a BLAST! Wish every child in the world could have a mom like you! I think you are amazing and your family is blessed to have you!